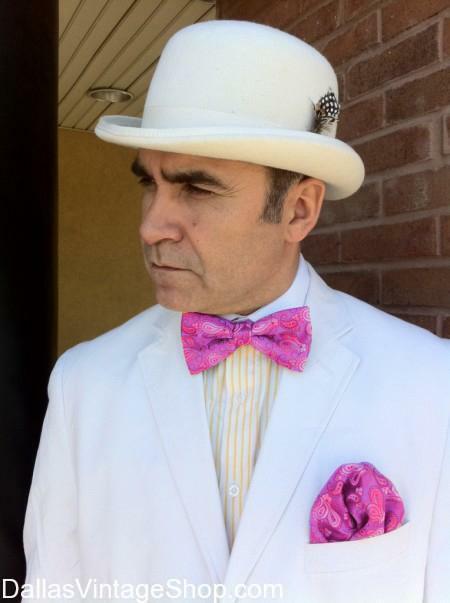 Valentine’s Men’s Good Looking White Suit, Pink Bow Tie & Pocket Square. We have the largest collection of Valentine’s Men’s Clothing in the Dallas Area. Our Handsome, Romantic Valentine’s Men’s Clothing Collection includes Tuxedos, Suits, Blazers, Ties, Pocket Squares, Vests, Formal & Casual Attire and an unlimited supply of accessories that never end. Get Unique Sharp Dressed Men’s Attire that you have never imagined. Your choices are unlimited. You have never seen so many Pink, Red and White Quality Clothing items in one place. From Supreme Quality Celebrity Status Valentine’s Complete Fashion Ensembles to Median and even economy pieces and accessories, you will find what you need to make the romantic impression you want.